This drink is probably one of the first of its kind to hit SA shores instead of the conventional energy drink this one as the name suggests is a drink to do quite the opposite a herbal concoction to help you relax and sleep peacefully. The Look: Very straight forward design! I feel the simplicity of this dark cobalt blue can, pictured with a clear starry night just sets the scene of relaxation with the crescent moon. 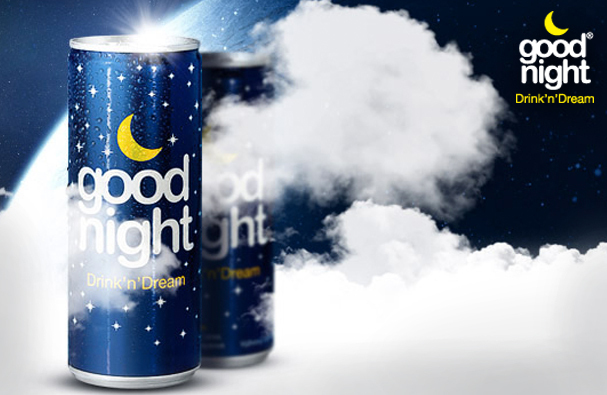 The words “Good night Drink’n Dream” is clearly the slogan here. Lightly carbonated drink, pleasant faint smell. I find it not really fruity, but a slight hint of bubble gum, mixed with a light berry flavouring. The flavour is cactus fig which is more commonly known as prickly pear. This product is quoted to: relieves stress and pressure shortens the time it takes to fall asleep helps retain deep regenerative sleep helps individuals to ease PFT and reduce anxiety, fear and stress during flights specially developed to ensure peaceful sleep during flights reduces jet lag ensures a healthy sleep for maintenance of energy all day long ensures a relaxing sleep promoting better sports achievements ensures a peaceful sleep resulting in better job achievements. Now I’m not an insomniac myself I usually pass out by the time I hit the bed but this will be handy for me when I’m on a flight as I do battle to sleep on planes but even without trying it on the plane I did feel more relaxed and a bit sleepy after I tested it and taking a close look at the ingredients it appears to be a winning formula. If you break down some of the ingredients you can see why this drink will not fail you. *Valerian: the main ingredient a natural sedative used to treat insomnia, anxiety and nervous restlessness. *Lavender is used to lengthen total sleep time, increase deep sleep, and make people feel refreshed. I have always been a fan of lavender scented candles for sleeping. *Rose Hip: The adrenal glands are responsible for releasing hormones like adrenaline and cortisol, which help you react to stressful situations. Rose hips may help support your adrenal and other glands when your body is under stress. *valerian ROOT has been used throughout history as a sleep aid, but some research suggests that its ability to calm may be chalked up to a placebo effect. You can find these at selected Spar stores nationwide.